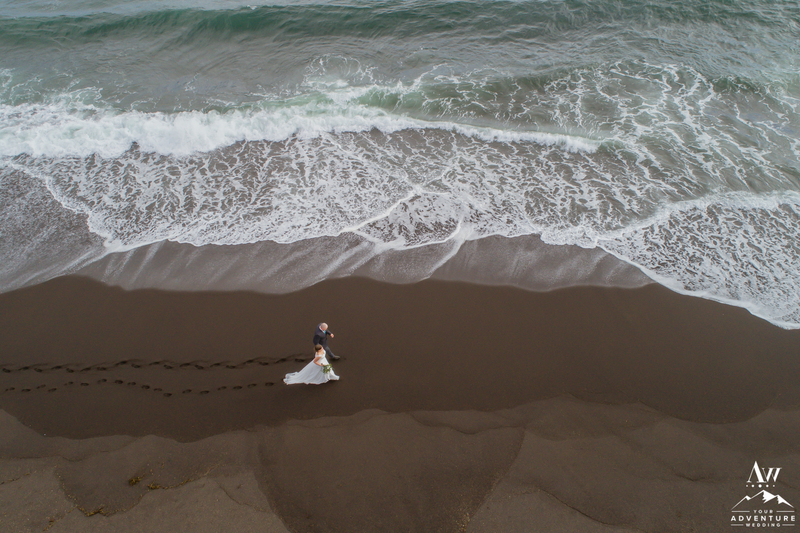 One of the countless things our Iceland Adventure Wedding Planner team talks about on a initial Skype call with potential clients is how unpredictable and challenging the Icelandic weather can be. And frankly, if they (and their guests) can handle it, since our full day adventure weddings happen rain or shine. It is important to set yourselves and you guests up for a successful day of adventuring so having everyone pack “go bags” is extremely important. Let’s embrace the reality of having a crazy weather day during your adventure wedding in Iceland and get prepared for it! Today we happily walk you through… Packing a “Go Bag” for Iceland Adventure Wedding! So why is a “go bag” even needed? Iceland is the most unruly weather place you will EVER experience! No joke. It is super common for Iceland to have a steady 16 mph winds just like everyday and sometimes gale force wind or sand storms (IE, 60+ mph winds). More often than we have overcast skies that could bring any element down from sideways rain, snow, sleet, or even just an annoying constant drizzle. There is a huge difference in being prepared for it and enjoying versus not and being insanely miserable. Eloping in Iceland and spending the day exploring will prove to be one of the most exciting and invigorating days of your lives! So let’s make sure the weather won’t spoil it for you and get you prepared to PLAY in it! Will you be having a hiking wedding ceremony or can the super jeep get you right in front of your private waterfall wedding ceremony spot? 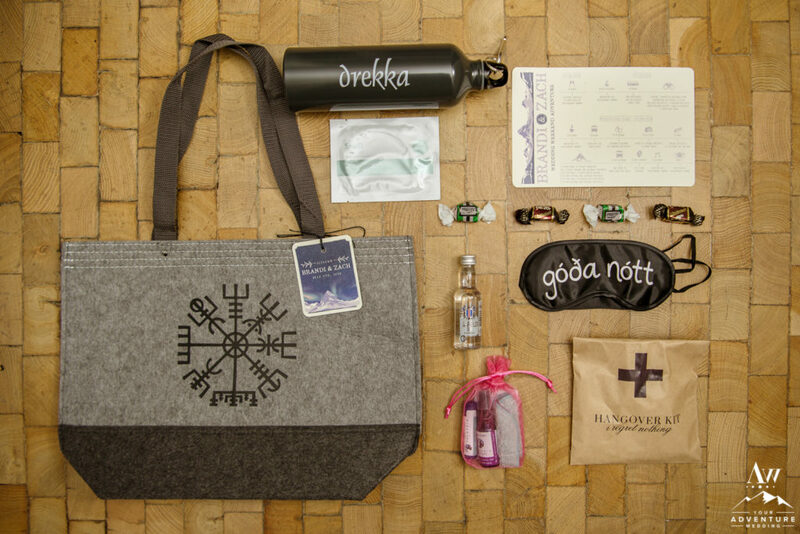 Packing a “Go Bag” for Iceland Adventure Wedding is super easy and we will break it down for you in 3 sections for you to consider along with giving a shout to our favorite suppliers. The actual “Go Bag” for your Iceland Elopement that you’ll put all of your items in… Our favorite backpack type is a Osprey Ultralight Stuff Pack. It’s one of the more comfortable and easy “day” backpacks we have ever encountered. If you aren’t a “backpack” type of person and want something a bit more easy then we would suggest a canvas bag that says “And so the Adventure Begins” so you can remember your adventure months to come when you’re getting groceries! Portable Charger with your phone charging cords, our favorite is RAVPower. A “Go Pro,” because who doesn’t want to capture crossing a river in a super jeep?! Bluetooth Speaker (if doing a bus wedding adventure or have a need for your Iceland cave wedding ceremony). Our favorite is JBL Xtreme. Your rings! Our favorite type to exchange for adventurous couples are the silicone ones! Check out Swagmat Men’s and RINFIT for women. Vow Books! Don’t know what those are? Head back to our previous Iceland wedding blog post explaining what Vow Books are. A huge “No No” with us is reading vows off of your phone or hotel stationary. We encourage you at the very least to invest in paperback ones to write in like Lillian Rose crafts (super affordable too)! Any cash payments you owe to vendors in envelopes (people like your Iceland hairstylist, makeup artist, celebrant, etc) and if you wish to tip any of the fabulous people involved in your Iceland wedding. Stainless Steel Water Bottles! The worst thing you can spend your money on in Iceland is water. Our water is the most amazing (and safest) to drink on the planet. So fill your Adventure Water Bottle up from the tap or at your private waterfall after your ceremony! Hot Hands! In between your Iceland wedding photos, it is nice to put your coat back on and stick your hands in your pockets that have Hot Hands in them! Towel(s) in case you get insanely wet! Borrow them from the hotel, just be sure to bring them back. Umbrellas! But if you’re an Iceland Wedding Planner, we always have clear ones in our gear box. If you’re not one of our clients, we highly encourage you to purchase Totes Signature Clear Umbrellas! Personal Snacks to keep you from getting “hangry!” …My personal favorite: Champagne and Mojito Gummy Bears! 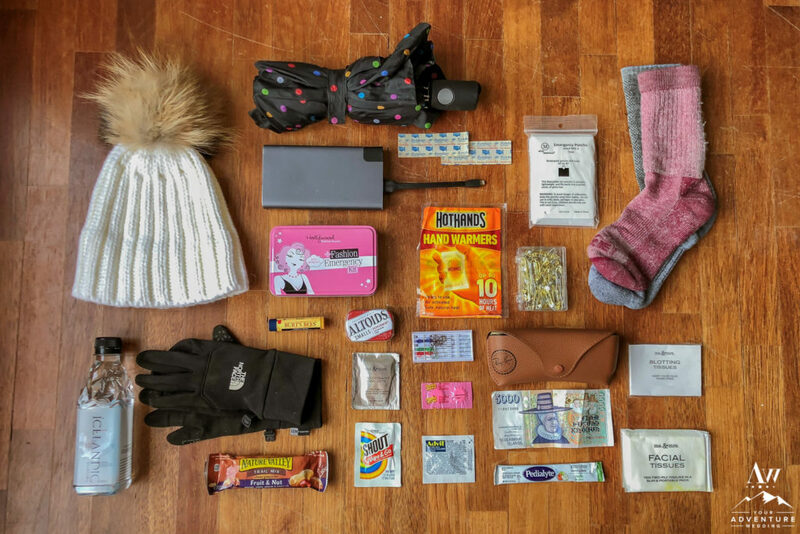 Feel free to also review the guest packing section of this post to see if any other items apply to you both while packing a “Go Bag” for Iceland Adventure Wedding! Bridal Emergency Kit. No need to pack this if you have hired our team as we have an endless one that has even more stuff! But in case you want your own, our favorite travel worthy one is The Minimergency Kit. Fur Shawl, we love this faux one from Caracilia! Guess what, we also have a fantastic Iceland Wedding Planner blog post on Bridal Coats if you want more options! Gloves- Our favorite Arctic wedding gloves are by 66 North, soooo warm! A Parka to wear in between if it’s crazy cold, like the Snaefell Parka from 66 North! Scarf or Blanket to bring along if you are opting out of a shawl. 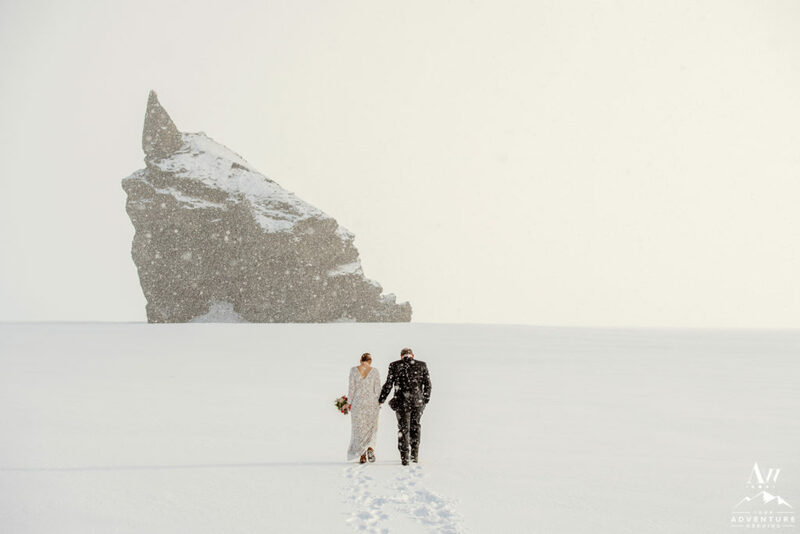 Our Iceland Wedding Planner pick is from Icewear, the Hlýja Wool Blanket. Extra Socks! Like wool ones from Icewear. Groom Wedding Day Survival Kit by Lillan Rose! Has all sorts of things he might forget or need! Waterproof Socks, nothing worse than a cranky groom because he has wet feet! Our favorite problem solver while packing a “go bag” for Iceland adventure wedding, are SealSkinz. Rainboots, so you can run through rivers and hike up mountains! Our current favorite are Sperry Men’s Avenue Duck Rain Boots. Rain and Windproof Coat like the Snaefell Jacket from 66 North. Flask to fill with Icelandic Alcohol, you know just in case you need a little rainy day pick me up 😉 Our favorite is from My Trendy Kitchen. Medications they may need for 8-12 hours adventuring (IE, things like Tylenol, DayQuil, cough syrup, etc). Rain and Windproof Gear – Our favorite men’s pants for guests are the Prana Brion Pant. Layers (they will likely wear) like long underwear, Under Armor, etc. See our “What to Wear to an Iceland Wedding” blog post for more info on your guests preparing. Adventurous wedding footwear like hiking boots, Sorels, and Sperry’s. We are absolutely loving Sperry’s Saltwater Rainboots and Sperry Duck Rainboots for men right now! Some people bring an extra pair too! Fleece Lined Leggings are our favorite (you’ll love ladies!)! Sooo deliciously warm! A Hat and Gloves. Our favorite is the Kaldi Arctic Hat from 66 North or Reynisfjara Wool Hat by IceWear. Things to entertain yourself between locations (or if you are bringing a child) like a Ipad, book, etc. Travel Emergency Kit (with things like band-aids, stain remover, sewing kit, etc). Water Bottle (Dare you to fill it up at one of our countless waterfalls!) and Personal Snacks. …My personal favorite: Champagne and Mojito Gummy Bears! Money / Credit Card as some of the bathrooms in Iceland require a payment to use. Personal things like chap-stick, sunglasses, emergency poncho, mints, facial tissues, safety pins, umbrella, fashion tape, etc! A camera! Although a professional photographer will be in tow, it’s nice to capture the beauty of the unique places you will experience! Our favorite rugged travel camera is the Olympus Tough Camera. A backpack to put it all in like the Marmot Brighton Backpack.